Ginger has high medicinal value. Its main constituent gingerol is an anti-oxidant. The anti-inflammatory properties of ginger help in increasing digestion and therefore can be extremely effective to cure stomach ache. All you have to do is boil some water and add finely chopped pieces of ginger to it. Let it boil for another 3-5 min. Then strain the water and drink it in sips. You can also add some honey to the water to sweeten the taste. Alternatively, you can buy ginger tea or ginger ale from the market and drink it. Another method is to grate some pieces of ginger to extract the juice and massage the belly with this juice to ease the pain. Lemon helps in curing indigestion and hence cures the stomach ache caused by it. You can have it in the form of lemon tea or lemon water. Both are equally effective in curing the ache. You may also add honey to the lemon tea to make it taste better. While making lemon water, make sure that the water is warm before you add lemon juice to it. To make the drink more effective you can also add a pinch of black salt to it. These drinks may be had 3-4 times a day till the ache vanishes. Medical studies have proven that peppermint helps in improving the flow of bile from liver to gallbladder. Bile are used by the human body for digestion, thus having peppermint improves the digestion. Mint also have a soothing effect on stomach muscles as it helps in relaxing them and thus reducing the ache. You can find peppermint readily available in the market either as mint tea or candy. Fresh mint leaves are also easy to find as it grows almost everywhere. You can either chew the leaves directly or boil them with water and have a warm mint tea. Either way, it will relax you and ease the pain. Sodium Bicarbonate or more commonly known as baking soda is a strong antacid, i.e. it helps in neutralizing stomach acid thus curing stomach ache. All you need is one teaspoon of baking soda mixed in warm water to relax your stomach. Club soda is also an effective cure as the carbonation induces burping which helps in releasing trapped gases in the stomach. You can mix lime with soda to make it more effective. You can also drink other carbonated beverages which will have the same effect of inducing burps. Chamomile is anti-inflammatory in nature. It relaxes the muscles of upper digestive track, thus smoothing the contractions that move food through our digestive system. This further eases the stomach cramps. Chamomile also has a calming effect on the nerves due to its sedative nature. Thus, having chamomile tea can reduce the stomach ache significantly due to both its anti-inflammatory and sedative properties. 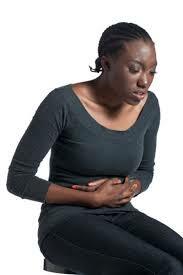 Applying heat to the stomach is one of the best ways for relieving stomach ache. Heat helps in relaxing the stomach muscles. It also increases the flow of blood to the skin surface. This results in reduced awareness of pain in the stomach. Heat treatment can be given in a number of ways. You can use heating pads or hot water bottles. You can also make a warm compress for yourself with the help of a clean sock and raw rice or salt. Just heat up the rice or salt to a comfortable temperature and fill the sock with it. Then lie down and put the sock on your stomach and let the heat transfer to your stomach. The heat will ease the pain and also provide a soothing effect. Fennel seeds aid the secretion of digestive juices in the body. Thus, they are extremely effective in curing indigestion. They can be chewed directly or can be taken in the form of tea. To make tea, add fennel seeds to hot water and let it sit for 5-10 min. Then strain the water and drink it. Fennel seeds also help in reducing inflammation and the pain caused by it. Carom seeds can also be used in a similar way as fennel seeds, either chewed directly or as tea. When making tea with carom seeds, you can also add equal amount of black salt to the warm water to enhance the effectiveness. It is a very popular indoor plant and it can be easily found in many households. Aloe Vera juice is also readily available in most grocery shops these days. It is one of the best natural remedies for various ailments. Along with its multiple health benefits, it is very effective in curing stomach ache caused by indigestion, inflammation or constipation. Charcoal is effective in neutralizing toxins in our system. Activated charcoal is commonly used for curing food poisoning. If you are experiencing stomach ache due to minor food or alcohol poisoning, then you can have a burnt toast to ease the pain. The charcoal in it will neutralize the toxins in the body and will help in processing the food or alcohol. However, in cases of severe food poisoning, then visit a doctor. Apple cider vinegar acts like a cleanser for the body. It absorbs away those nutrients which are not required by the body and thus cleanses our system. Add 2-3 teaspoons of apple cider vinegar in a glass of warm water and drink it. It will assist the body in digestion and ease stomach cramps. It is also effective in reducing discomfort in cases of heartburn.